50 games in 1 pack, spanning a 10 year career from hobbyist, to novice, to barely competent game designer! 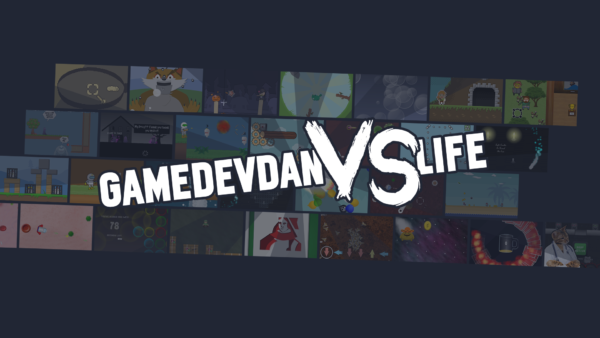 GameDevDan vs Life features a whole host of jam games, throwaway projects and – dare I say it – even a few decent titles. Open up the launcher and play the games in any order you like. Sort from oldest to newest and you’ll be looking at the journey of a young man from greasy teenager to slightly-less greasy adult. Alternatively, sort from best to worst and have a go at a few of the pack’s hard-hitters such as GMC Jam winner Chickens and Moles or Android smash-hit Gyro Boss (re-imagined for PC). With games spanning genres from arcade shooter to murder mystery, guitar sim to platform-puzzler, there’s something in the pack for every mood. Climb inside the life of GameDevDan – will you come out clean on the other side? There’s only one way to find out.